Almost everybody knows that your posture at your desk can be a big factor in any neck and shoulder pain you’re getting. But man, is it hard to sit up straight at a desk all day! 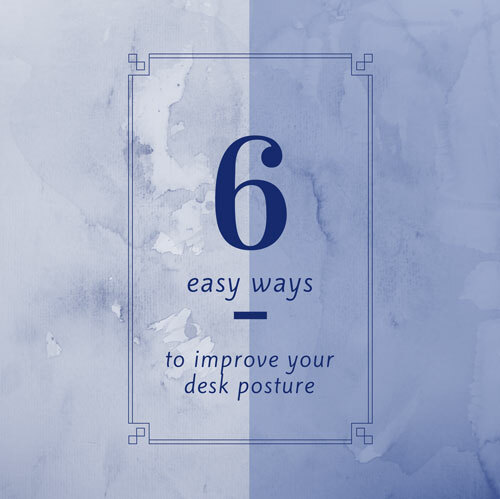 We’ve prepared six easy ways you can improve your posture at your desk. It includes exercises or stretches you can do to make it easier, others are tips to help where people often get it wrong, or to help you remember to sit well at your desk. Pick one to start doing – just one – and when that’s easier for you, you can start adding the next one. I can hear everyone who’s ever been to see me rolling their eyes (because I say this all the time). I know, it’s boring. So you gotta believe me when I tell you, I say it over and over again, it’s because it’s sooooo important. There are about a million ways that our shoulders get pulled down and forward over the course of our lives. What’s the use of straining our back and back-of-the-shoulder muscles to try and sit up straight, when we have tight, wound-up chest and front-of-the-shoulder muscles pulling us forward? 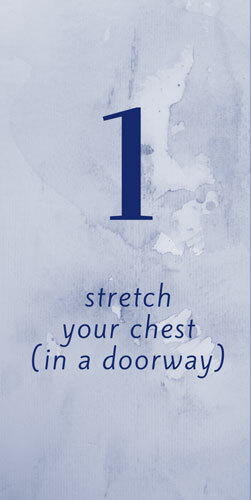 You can either do the portable, do-anywhere doorway chest stretch, or the lying-down at the end of the day stretch. Want some help with how to do this stretch? Check out this posture post we did, that includes a video of the doorway chest stretch. The other, really important thing, is to wake-up those under-used back muscles as much as possible. While we’re sitting hunched over all day, the muscles in the mid/lower-mid part of our back can start to switch off after a while. 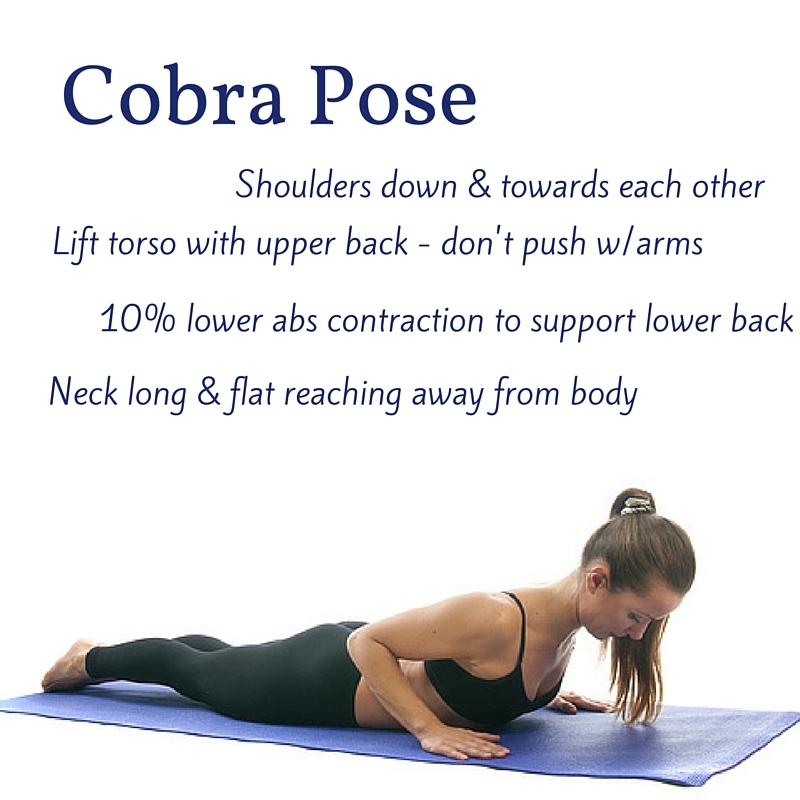 The cobra (a yoga pose) is great for activating those middle-back muscles. Try to find a 2 or 3 minute window when you can do this every day. It may be before you leave for work. If you’re in an office, it may be sometime during the day. Possibly after you get home in the evening. If you can start to do this regularly, you’ll start to notice it’s easier to sit up straight at work, because the postural muscles in your back will be stronger. When I ask someone in my treatment room to sit up straight, 85% of the time they pull their shoulder blades up and together and arch their back forward. 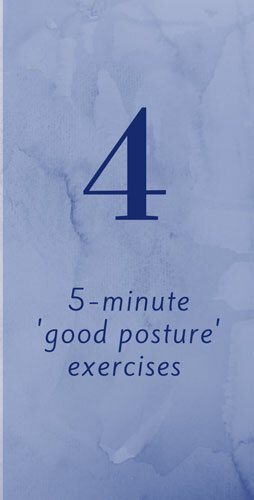 This is not only NOT good posture, it also will create other muscle tension or imbalances. Use your abdominals to keep your back straight and let your shoulder blades drop down and towards each other (gently). Think: drop your shoulders and keep a straight back. And if you can practically touch the tops of your shoulder blades together, you’re doing it wrong. If you think of your posture muscles like any other muscle, it’s obviously unrealistic to go from ‘bad’ posture all day to perfect posture all day – those underused postural muscles WILL get fatigued. Instead, set an alarm on your phone or outlook calendar for three times a day, and try to sit in a better position for five minutes. Once five minutes becomes easy, add a minute, and then again. When you’re doing this, it’s better to go towards better posture than past it. When you’re not used to sitting correctly, it’s easy to overcorrect and go too far. Make all the changes subtle and your body will adapt more quickly, getting used to being upright, until it will start to feel weird to slouch or hunch over. You don’t run for ten miles the first time you put on some trainers, so don’t expect your posture muscles to be able to work for eight hours when they haven’t been working at all. While it’s true that you can’t expect to sit in good posture all day from day one, you should still try to avoid slouching for eight hours as well. It’s easy to forget about your shoulders when you’re busy or stressed, so using a trigger to remind yourself is a great way to get out of the habit. Wear a rubber band on your wrist, or put a post-it note on the side of your monitor and when you see it, remember to sit up a little straighter. This is also called ‘externalising memory’ because instead of trying to get your brain to remind you, you’re getting something else to do it for you. Holding your breath is common when stressed, and can do all sorts of damage to neck and shoulder muscles. Take a deep breath into your stomach. Focus on allowing the breath to go down into your stomach and let your shoulders open up in the front, instead of lifting your rib cage up and letting your shoulders roll forward. 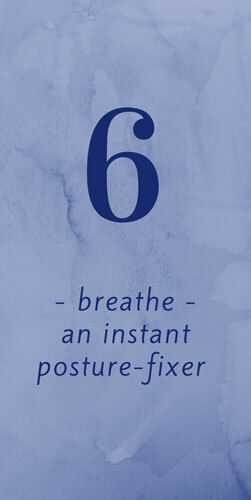 As you exhale, let go of the tops of your shoulders and let your shoulder blades drop down your back. You know me, and you know I’m all about making things manageable. Instead of adopting all of these right away, choose one. Choose the easiest one for you to do, and do that. Stretch your chest every time you go make a tea, or do the cobra every day when you get home from work. Wear a rubber band or set a timer for your five minutes, three times a day. Whatever it is, choose ONE thing, and once that’s easy and you don’t even have to think about it, then choose another to add to it. If you have desk-related neck and shoulder pain and would like to get started on improving it, you can enrol in our free 7-day minicourse for neck & shoulder pain for desk workers. Which one are you choosing? Or have you tried one, and have a question? Did this help you, or make you think of something else that might help everyone too? Go ahead and leave a comment below, or tweet or post on our facebook page. Sending this information to my team at work!